Screenshot of Mac OS X Leopard. Note how the Dock is different to previous versions of Mac OS X.
Mac OS X Leopard (version 10.5) is the sixth major release of Mac OS X, Apple's desktop and server operating system for Macintosh computers. Leopard was released on October 26, 2007 as the successor of Tiger (version 10.4), and is available in two editions: a desktop version suitable for personal computers, and a server version, Mac OS X Server. It retailed for $129 for the desktop version and $499 for Server. Leopard was superseded by Snow Leopard (version 10.6). Leopard is the final version of Mac OS X to support the PowerPC architecture as Snow Leopard functions solely on Intel based Macs. New Desktop, comprises a redesigned 3-D dock with a new grouping feature called Stacks, which displays files in either a "fan" style, "grid" style, or (since 10.5.2) a "list" style. R.L. Prior, on the ThinkMac blog, criticized the shelf-like Dock along with a number of other changes to the user interface. Dictionary can now search World Heritage Encyclopedia, and a dictionary of Apple terminology as well. Also included is the Japanese-language dictionary Daijisen, Progressive E-J and Progressive J-E dictionaries, and the 25000-word thesaurus "Tsukaikata no Wakaru Ruigo Reikai Jiten" (使い方の分かる類語例解辞典? ), all of which are provided by the Japanese publisher Shogakukan. Spotlight incorporates additional search capabilities such as Boolean operators, as well as the ability to search other computers (with permissions). In mid-December 2006, a pre-release version of Leopard appeared to include support for Sun’s ZFS. Jonathan Schwartz, CEO and President of Sun Microsystems, boasted on June 6, 2007 that ZFS has become "the file system" for Leopard. However, the senior project marketing director for Mac OS X stated on June 11, 2007 that the existing HFS+, not ZFS, will be used in Leopard. Apple later clarified that a read-only version of ZFS would be included. Leopard is the first operating system with open source BSD code to be certified as fully UNIX compliant. Certification means that software following the Single UNIX Specification can be compiled and run on Leopard without the need for any code modification. The certification only applies to Leopard when run on Intel processors. Leopard ships with two firewall engines: the original BSD IPFW, which was present in earlier releases of Mac OS X, and the new Leopard Application Layer Firewall. Unlike IPFW, which intercepts and filters IP datagrams before the kernel performs significant processing, the Application Layer Firewall operates at the socket layer, bound to individual processes. The Application Layer Firewall can therefore make filtering decisions on a per-application basis. Of the two-firewall engines, only the Application Layer Firewall is fully exposed in the Leopard user interface. The new firewall offers less control over individual packet decisions (users can decide to allow or deny connections system wide or to individual applications, but must use IPFW to set fine-grained TCP/IP header level policies). It also makes several policy exceptions for system processes: neither mDNSResponder nor programs running with superuser privileges are filtered. Processor type and speed are checked during installation and installation halted if insufficient; however, Leopard will run on slower G4 processor machines (e.g., a 733mhz Quicksilver) if the installation is performed on a supported Mac and its hard-drive then moved to a slower/unsupported one (the drive may either be an internal mechanism or a Firewire external). Leopard can run on the later flat panel iMac G4s, the first iMac G5, second iMac G5 (with the ambient light sensor), third iMac G5 (with iSight), iMac Intel Core Duo and (present day) iMac Intel Core 2 Duo, PowerBook G4, Power Mac G4, Power Mac G5, iBook G4, MacBook, MacBook Pro, MacBook Air, Mac Pro, Mac Mini, Xserve, Xserve G5, Xserve RAID, Macintosh Server G4, and later eMac models. Leopard can run on older hardware as long as they have a G4 upgrade installed running at the 867 MHz or faster, have at least 9 GB free of hard drive space, 512 MB RAM and have a DVD drive. Leopard however will not run on the 900 MHz iBook G3 models even though they exceed the minimum 867 MHz requirement. This is due to the lack of AltiVec support in the G3 line of processors and the fact that most pre-G4 and early G4 systems do not have video hardware capable of supporting Core Image, two technologies Leopard relies upon heavily, among others. Leopard can be "hacked" (see below) to install on these G3 and pre-867 MHz G4 machines but the system may behave erratically and many of the programs, features, and functions may not work properly or at all. 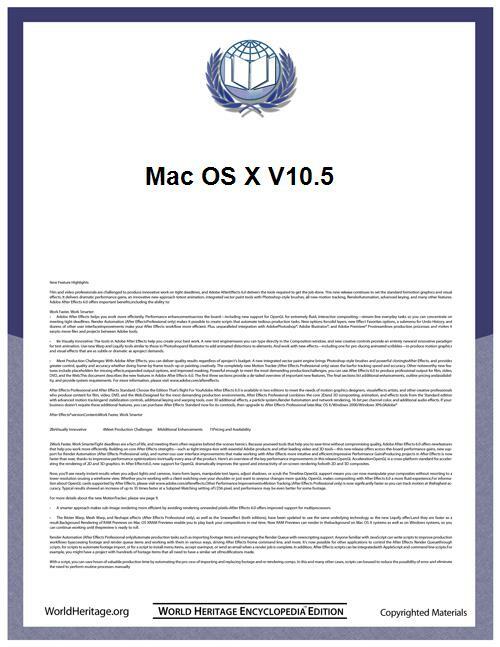 As of Mid 2010, some Apple computers have firmware factory installed which will no longer allow installation of Mac OS X Leopard. These computers only allow installation and running of Mac OS X Snow Leopard. However, some computers (such as the 2011 model of the Mac mini) can have Leopard installed on them without hacking. After Leopard’s release, there were widely-reported incidents of new Leopard installs hanging during boot on the blue screen that appears just before the login process starts. Apple attributed these problems to an outdated version of an unsupported add-on extension called Application Enhancer (APE), from Unsanity which had been incompatible with Leopard. Some users were unaware that APE had been silently installed during installation of Logitech mouse drivers. However, only the users who did not have the latest version of APE installed (2.0.3 at that time) were affected. Apple published a knowledge base article on how to solve this problem. Google announced that the Chrome browser will be dropping support for Leopard starting on Chrome 21. By that time Chrome will no longer auto-update, and new Chrome installations are unallowed. Their rationale for removal of support is that Leopard is an "OS X version also no longer being updated by Apple." Firefox also dropped support for Leopard after it shipped Firefox 16 in October 2012.